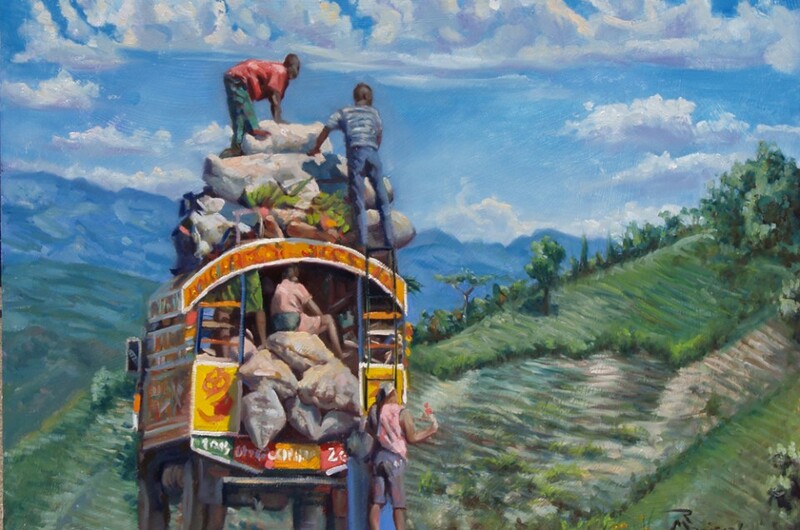 Renowned Charleston artist, Robert Maniscalco, has created an exhibition of paintings, expressing hope and renewal, inspired by his Vision Trip to Haiti in November 2014. The book, “Quench,” is to be released in November 2015. Pre-release sale of Quench, the book! Exhibition at Threshold Theatre Company, 84 Society, Charleston, SC Now – November 11. City Gallery, North Charleston Coliseum, December 3-31. Opening reception on December 3, 5-7 pm. Here you will see the entire exhibition. The Quench Project (TQP) is a story of survival, an exploration of human desire and the many ways we cope with our longings. It consists of a series of paintings, photographs, some included in an upcoming book and a short film, celebrating the resiliency of the human spirit. Renowned Charleston artist, Robert Maniscalco, best known for his distinctive commission portrait work and Fine Art has created a series of paintings, called “The Quench Project” from his vision trip to Haiti. Advanced copies of “Quench,” are available to the media for review upon request. Quench is set for release in November, 2015. As part of The Quench Project, Robert is also finishing a short documentary, called “Out of the Darkness,” which will be available soon on youtube. This is Robert’s first foray into Christian literature, but it is friendly to all readers. “The Quench Project” explores alternatives to societal ideas about beauty, tragedy and survival. Robert has created a series of 14 paintings, with others in the planning stages. His theme is the resilient nature of humans to rise “out of the darkness.” One purpose of the project is to create awareness around the water crisis many are facing in the world right now. I believe artists are the conscience, the teachers of society. The best artists have the ability to go deep within themselves and bring up the treasures, usually in the form of questions, which form a blueprint for a meaningful life. As an artist, I am always looking for ways to bring meaning and clarity into the world, to use my God given talent to inquire and to edify. So I share my journey, finding and expressing whatever insight, with which I have been blessed, to whomever is willing to engage in a shared human journey. I do this through my painting, my writing, my acting/directing, my music and my teaching. My goal as a visual artist, as a painter, is to explore the full range of my medium, which is light. I have developed several bodies of work exploring a variety of structures and subjects, but the poetry of light on form keeps coming back into my work. Light is the force which reveals the subtleties of nature, particularly the human condition, revealing what it means to be human in our journey toward the light. This journey toward the light is a theme which runs through all my work. We are all on a journey of survival, to make something magnificent out of what we are given. My purpose as an artist is to find and celebrate the many creative ways we humans find to overcome and grow as a result of this journey. Although expressive realism is my dharma I have also begun to explore the possibilities of narrative and poetry using color and light to transport the viewer of my work into another realm of reality.